With the change in the seasons, our house has been invaded by spiders. 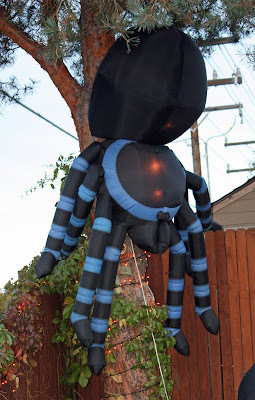 None, thankfully, as large as this Halloween decoration. My neighbor did find a real black widow on her front porch last week, which is real-life scary. Hmmm, me, too. Be careful BD. Whoa! THAT would get my attention! Heh! Looks like you are having a nice autumn in Boise. Here in Iowa it has been very cool and wet -- especially wet! Hope you let those two sleeping dogs lie! I see Boise State and Iowa are something like #5 and #6 in the BCS rankings! What I would like to see is Florida and Boise State play for the national championship and then I want Iowa to play USC in the Rose Bowl! That is what I really, really want to see happen! Take care and go Broncos! When we lived in Arizona, we'd find Black Widows every once in awhile in our carport shed! Yes, very scary. But not as bad as the small scorpions. I like spiders because they eat pesky bugs, but maybe not black widows! I wonder if there's a real blue-striped one like this somewhere. Beginning, or End, of the Road?